This engaging documentary follows a whale mother and her calf as they make their treacherous journey from Hawaii to Alaska which truly gives the viewer a unique insight into these majestic creatures. Each year, a swarm of humpback whales travel from the birthing grounds of Hawaii to Alaska in search of food. From watching this documentary, I was thoroughly amazed at how these whales worked together in search of food and how aggressive the dominant males of the pack were towards the female whales. The researchers also noted that whales "breach" the water which is called breaching and is sometimes used to draw the attention of other whales to food which simply proves just how amazing and intelligent these giant creatures actually are. Another interesting facet of the Blu-ray presentation was the ability of the researchers to identity the whales by their tales due to the colours, markings and scars. Even though these whales are truly gigantic in size, their main foe in this harsh waters are the Killer Whales that have been known to kill calves. Of course at the end of the day, man is the deadliest enemy of these graceful creatures and hopefully this Blu-ray disc can enlighten viewers again in this epic documentary which features some of the world's best cinematography thanks to Ross Isaacs whom at times, almost makes you believe that you are right next to these humpback whales. As opposed to the DVD version, the video quality boasts 1080p which simply looks amazing on our high definition TV. Match that with Dolby Digital 5.1 surround sound and it's almost like being with these majestic creatures. Sharp images, vibrant colours and extremely deep black levels. 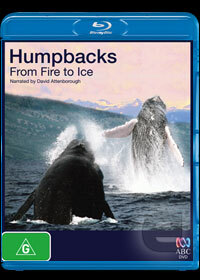 In conclusion, Humpback Whales from Fire to Ice is a brilliant wildlife documentary that features exceptional video and audio quality and is definitely a must have Blu-ray for those interested in wildlife.